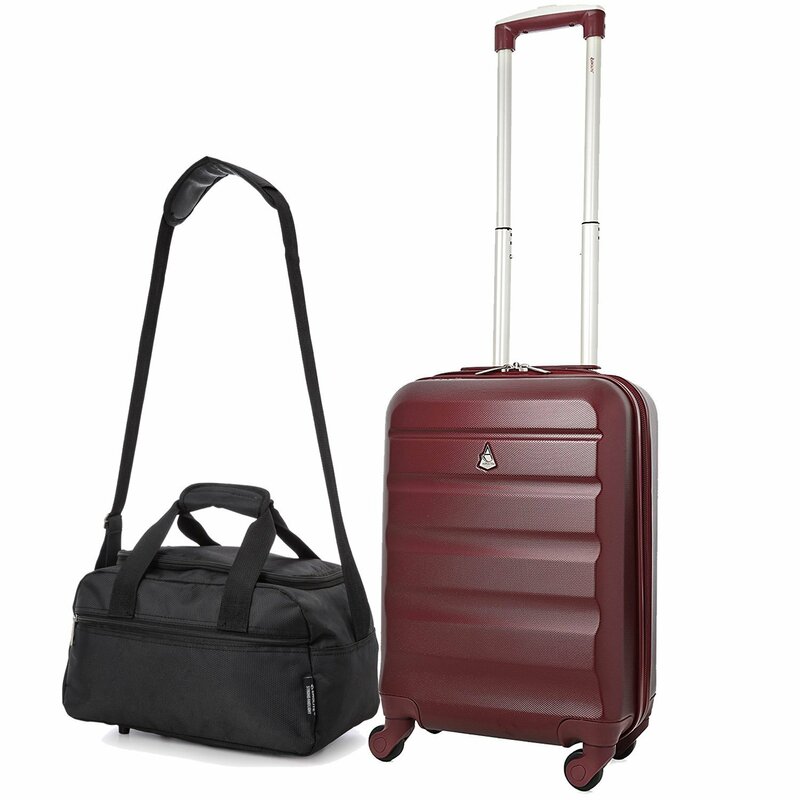 The Aerolite brand is proud to offer some of the world s lightest luggage sets, helping to ensure millions of travellers worldwide enjoy more of their travelling experience. 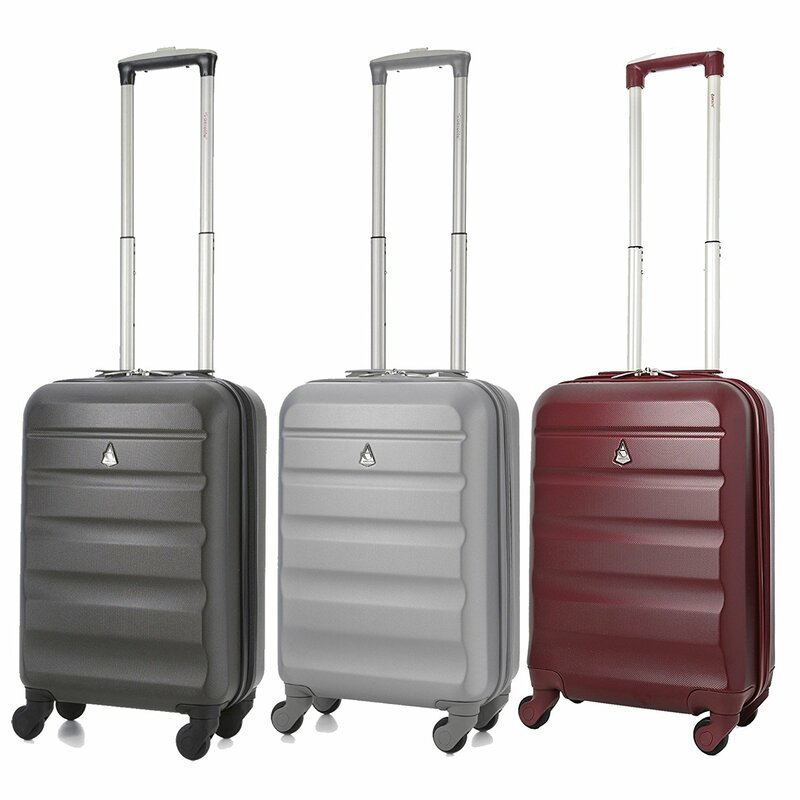 Available in 3 different colours, you re sure to find the perfect travel partner, and best of all these Aerolite suitcases come with a 5 year guarantee for peace of mind! The Aerolite range is exceptionally light without compromising on quality. Four spinner wheels provide seamless 360 degree movement, while the double-tube retractable trolley grip handles (actioned via a push button) allow simple and easy transportation, as well as making it easy to stabilise objects placed on top. The outer casings are made from durable anti-scratch ABS hard shell plastic material to protect against the rigours of travelling. Robust, smooth, chunky zippers on the main body make opening and closing the case simple, and each case includes a free 3-digit combination barrel padlock for extra security. The interior features packing straps and an internal zipped divider with elasticated pockets (perfect for shoes), to keep the contents in place during transit. The Aerolite brand is renowned for producing ultra lightweight luggage suitcases, helping thousands of holidaymakers beat weight restrictions at the check in gate. By reducing the weight of the suitcases, it allows travellers to pack more of their possessions, avoiding excess baggage cots, and peace of mind. 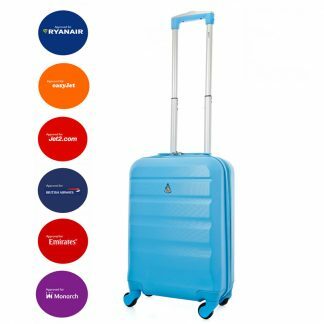 In addition, with a fantastic 10-year guarantee on all items, you can really buy an Aerolite piece of luggage with confidence The cabin-sized hand luggage 21 inch/55cm suitcase is designed perfectly to be taken on board with all major airlines including Ryanair, Easyjet, British Airways, Virgin, KLM, Air France and many more! 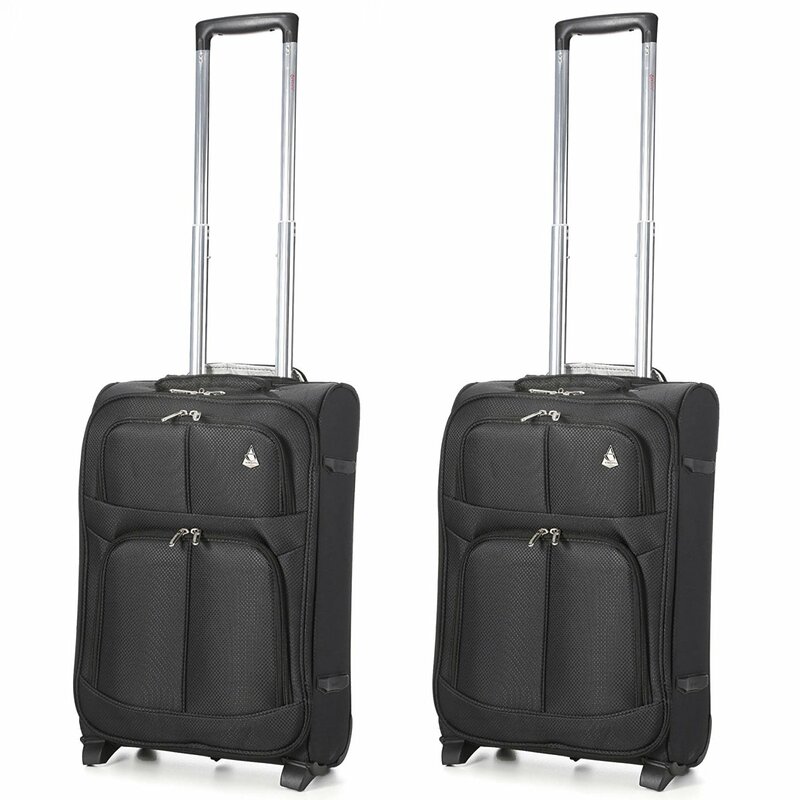 To aid with stability and greater performance, this spinner suitcase features 8 wheels rather than the standard 4. 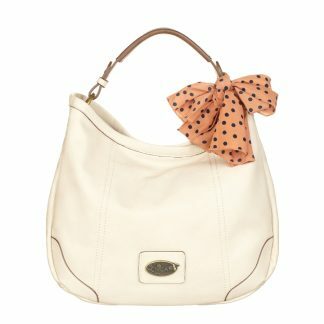 By doubling the number of wheels, the bag benefits from greater support, and increased reliability. Made from a high-quality Polyester material, the material is hardwearing, meaning it’ll stand up to any bumps or scratches that it’s subjected to whist travelling. 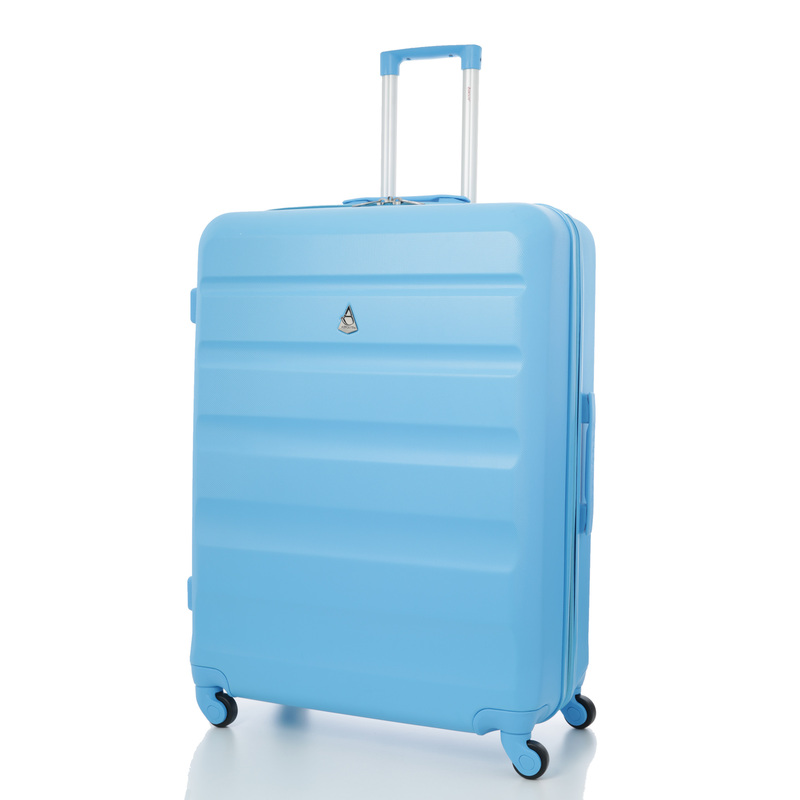 The suitcase features a smart-looking, but sturdy, titanium telescopic trolley handle, which retracts all the way back inside the case when not in use. Inside the case, you’ll find an attractive branded interior lining, with multiple compartments to store key items, packing straps to hold your belongings in place and an branded number lock which will help secure your bags zips together in order to safe-guard access to your bag. This suitcase is exactly 55x40x20cm to allow you to pack the maximum possible allowance for some of the UK’s most popular airlines, including Ryanair, Easyjet and British Airways (Please check online for other airlines) The Aerolite brand is renowned for producing ultra-lightweight luggage; helping thousands of holidaymakers beat weight restrictions at the check in gate. By reducing the weight of the suitcases, it allows travellers to pack more and to avoid excess baggage costs. Made from high-quality, rip-resistant polyester fabric, the case is hardwearing and designed to stand up to the rigours of modern transportation. 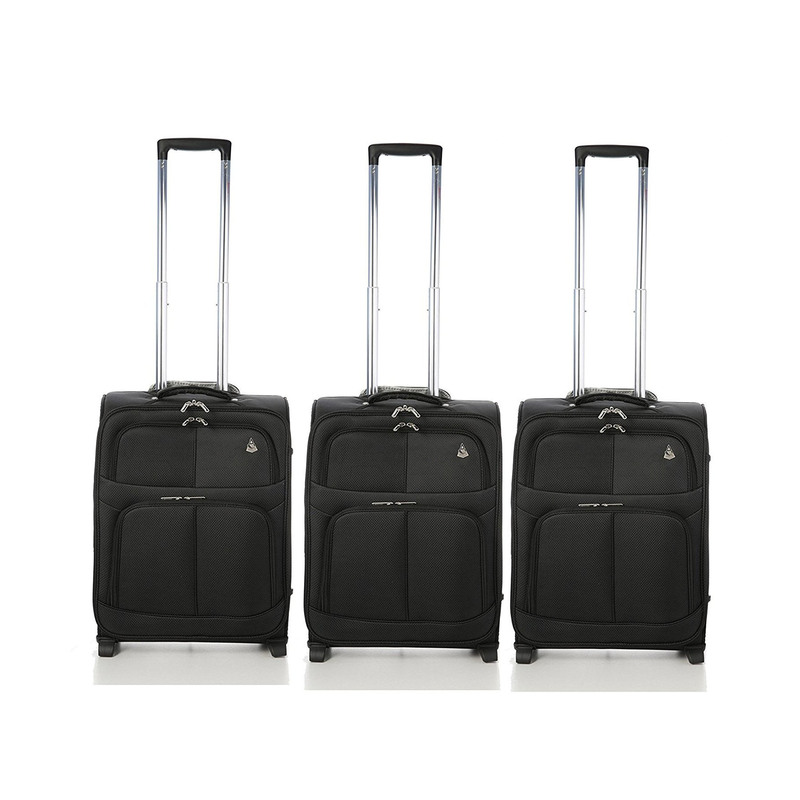 The lightweight frame, two wheels and retractable handle make transporting the case as easy and simple as possible. 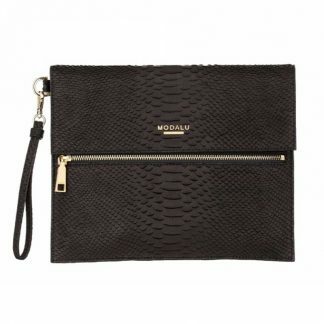 Inside the case, youêll find an attractive branded interior lining, with multiple compartments to store key items and packing straps to hold your belongings in place. We also include a 3-digit combination barrel padlock for added security. Plus, with a fantastic 10-year guarantee on all our Aerolite soft shell suitcases, you can buy with absolute confidence. 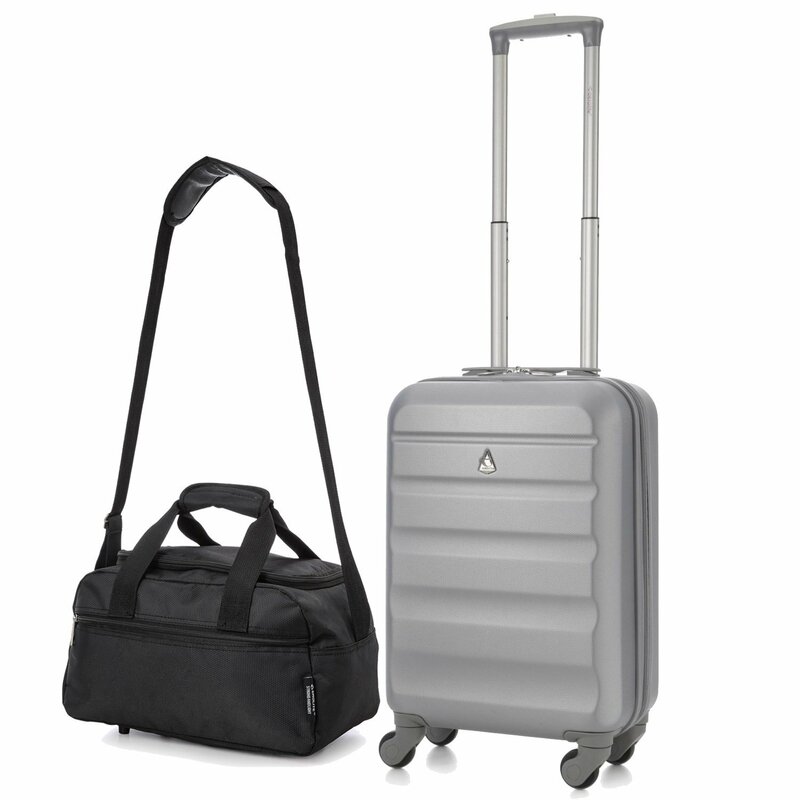 The Aerolite brand is renowned for producing ultra lightweight luggage suitcases, helping thousands of holidaymakers beat weight restrictions at the check in gate.ÃÂ By reducing the weight of the suitcases, it allows travellers to pack more of their possessions, avoiding excess baggage cots, and peace of mind. In addition, with a fantastic 10-year guarantee on all items, you can really buy an Aerolite piece of luggage with confidence The cabin-sized hand luggage 21 inch/55cm suitcase is designed perfectly to be taken on board with all major airlines including Ryanair, Easyjet, British Airways, Virgin, KLM, Air France and many more! 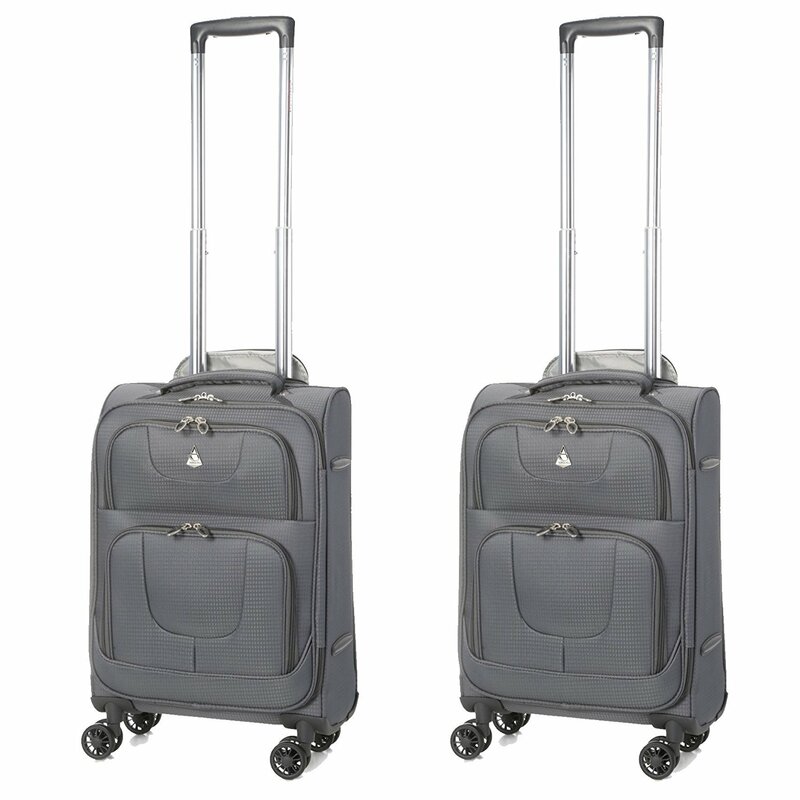 To aid with stability and greater performance, this spinner suitcase features 8 wheels rather than the standard 4. 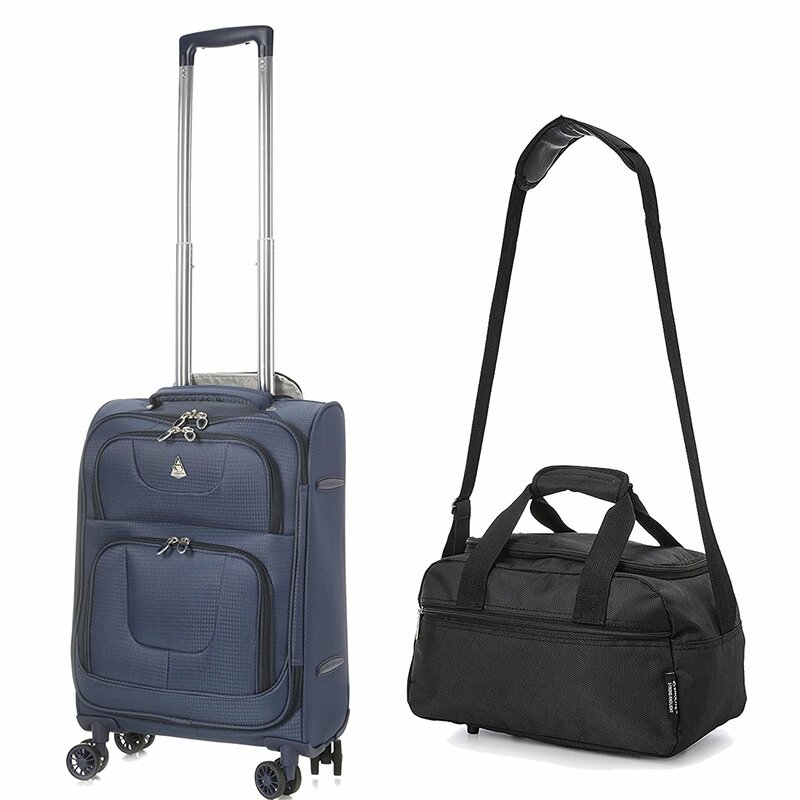 By doubling the number of wheels, the bag benefits from greater support, and increased reliability. Made from a high-quality Polyester material, the material is hardwearing, meaning it’ll stand up to any bumps or scratches that it’s subjected to whist travelling. The suitcase features a smart-looking, but sturdy, titanium telescopic trolley handle, which retracts all the way back inside the case when not in use. Inside the case, you’ll find an attractive branded interior lining, with multiple compartments to store key items, packing straps to hold your belongings in place and an branded number lock which will help secure your bags zips together in order to safe-guard access to your bag.